Plastic injected textured grip that’s pinned to the tang. Primary grind established at factory but may require further sharpening for desired edge. These parangs are authentically made in Bidor, Perak. Hand made by the original owner’s son, they have 80 years of experience in blacksmithing. Their works are famous for their hardiness and ability to keep a sharp edge. 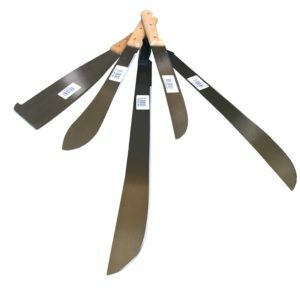 The blades are differentially tempered for maximum effectiveness and durability. 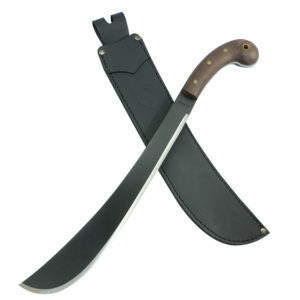 Ray Mears popularized this parang shape, which is very similar to the Duku Chandong of Sarawak. A very capable chopper in the right hands. Suitable for large branches , trees and anyone needing a good survival or bushcraft tool . 5.16 mm. / 2.11 mm. Please email me when these become available again. Thanks! Hey Chad! I just sent you an email! 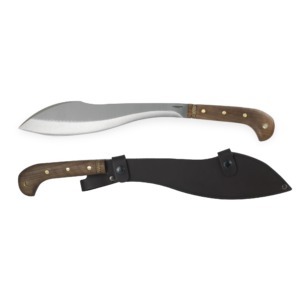 First off, I ordered the Bidor 10 inch Ray Mears styled Parang with Machete Specialist canvas sheath on Friday, and had it in my hands Tuesday morning before noon. It was well packed, so order fulfillment is excellent. Now for the tool – I am impressed. Yes, it is rough around the edges. I actually like that – when I buy a tool, I expect to use it and it sustain wear and damage. This tool is very functional – no frills, no wasted effort on polishing or concern for eye candy. You just look at it and you know it means business. The handle shape and material are excellent, and look almost indestructible. What impressed me most though, was the convex grind on the blade, it is almost perfectly symmetrical the length of the blade, and while it is still a rough grind, it is apparent that touch up with my diamond and ceramic stones will leave this beauty razor sharp. There’s snow on the ground, so I will postpone trying it out, yet from the weight, balance, and feel in my hand, it is obvious this is a serious chopper and clearing tool. 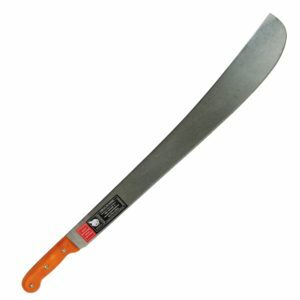 I have read of the Ray Mears style Parang being ideal for jungle work, and I can certainly see that in my minds eye. I have used cutting tools of many kinds, shapes, and sizes my whole life (67 years old), and am never without my razor sharp Benchmade Barrage. I now have a new favorite utility chopper, camp knife, and survival machete! This size is both capable and packable. Great as a camp knife as well as clearing tool. 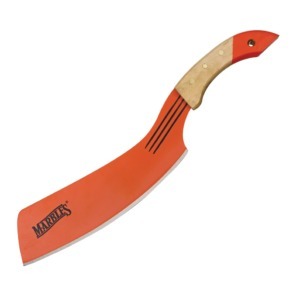 I’ve owned many machetes over the years and this is my favorite! Took a v sharpener to it and a butcher steel and ready to go.Cut bamboo and many limbs, and still shaving sharp. This is the most versatile blade I have ever used. This has replaced my ontario sp53 and my ontario sp51 mainly because of its weight and feel I put a nice edge on it with my work sharp I love how it takes me back to the south pacific , not for people who want things perfect but it’s for me . I will be placing a order for the 12in parangs in both styles can’t wait by the way I use it daily for preparing fire wood great differential heat treat very versatile feeling like I’m back in Borneo. 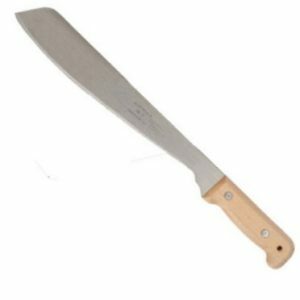 Condor Amalgam Machete -New for 2018!! !